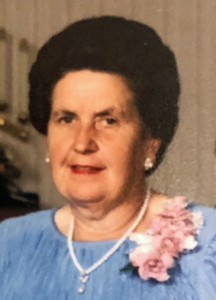 89-year-old Florence “Flossy” Cecelia (Braun) Helget of Sleepy Eye passed away Monday, December 3, 2018, at Sleepy Eye Care Center. Funeral Service is Thursday, December 6 at St. Mary’s Catholic Church in Sleepy Eye with interment at New Ulm Catholic Cemetery. Visitation is Thursday from 7:30-10:30 a.m. at Sturm Funeral Home in Sleepy Eye. Sturm Funeral Home of Sleepy Eye is handling arrangements.